Laurel Lance: What is so important that couldn't be handled over the phone? Dinah Drake: Do you remember our conversation about playing by the rules, about doing things the right way is usually the hard way? Laurel Lance: Why do I feel a lecture coming on? The Ninth Circle is upon us, an organization straight from the graphic novels. After having lots of episodes since the prison arc having been no main plot it feels great to have a main plot again and this was has a lot of potential. The episode actually contained some good drama, no bad scenes at all. The flashbacks was handled great, focusing more on Emiko to show her back story and there is a lot of Easter eggs inside those flashbacks and something that ties the story together in a magnificent way. 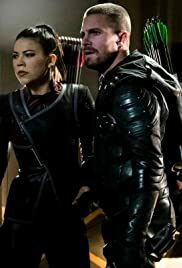 Some great character moments of this episode was of course the Green Arrow fight sequences and him using his bow in an talented and awesome way. Some other highlights was the presence of Robert Queen and the character Dante that I'm finding really great, he's also played fantastically by Adrian Paul.